(Francisco Kjolseth | Tribune file photo) People go about their day as the Salt Lake City Council, Salt Lake County, and the Utah Transit Authority gather on the North Temple Bridge/Guadalupe TRAX station in Salt Lake to announce Free Fare Friday to encourage greater use of transit during periods of poor air quality. On Friday, Dec. 22, no cash fares will be required on trains or buses in an effort to get infrequent or first-time riders to try out transit and use it more frequently. 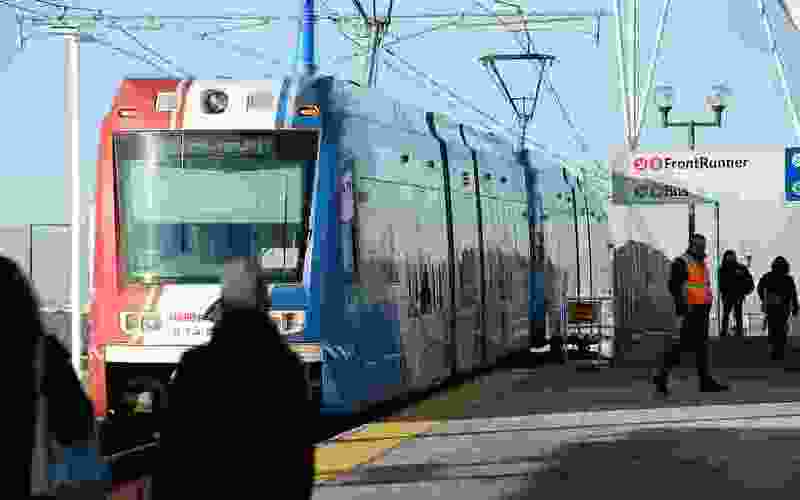 The scandal-scarred Utah Transit Authority could be radically reorganized, a sales-tax increase rejected by voters could be mandated, some highway funds may be diverted to mass transit, and registration fees for electric cars could quintuple. All those game-changing proposals are included in a 114-page bill proposed Thursday by a legislative task force created to look at how to fund transportation as gasoline tax revenues shrink and public trust in UTA erodes. It “will better our state” and help “it move forward,” said Rep. Mike Schultz, R-Hooper, co-chairman of the Legislative Transportation and Funding Task Force. • The current 16-member, part-time UTA board would be disbanded and replaced with a full-time, three-member commission appointed by the governor — who could fire members at will. That commission would hire a full-time executive director. Trent Nelson | The Salt Lake Tribune Jerry Benson addresses the board before being sworn in as the new president/CEO of the Utah Transit Authority (UTA), Wednesday August 31, 2016. Salt Lake County would nominate one of the commissioners; Utah and Tooele counties would nominate another; and a third would be nominated by Davis, Weber and Box Elder counties. Those six counties are served by UTA. • If counties do not adopt all transit taxes possible under current law by 2022, the state would automatically impose them. That means, for example, that the Proposition 1 sales-tax increase defeated in 2015 by voters in Salt Lake and Utah counties — largely because of mistrust of UTA — would be imposed at that time. • Funds that now go only for highways could also be tapped for UTA projects. But the Utah Transportation Commission — not just UTA’s board — would approve use of any such state money. Any UTA borrowing for such projects must also be approved by a state bonding commission. • Annual registration fees for electric vehicles could rise from the current $44 a year to $200, and those for hybrid vehicles could increase from $44 to $75. Officials say that roughly reflects how much they would pay in gasoline tax, which they now escape. Several of the proposals are generating controversy, although task force members praised the overall package as essential. Greg Bell, a former lieutenant governor who now heads the current UTA board, was critical of the proposal to create a new three-member commission to oversee the agency. However, House Speaker Greg Hughes, R-Draper and a former UTA chairman, said recently that full-time commissioners would have more power to dig in to the details of UTA management that a part-time board full of people “who darken the door maybe twice a month” cannot do. It gives them equal footing with full-time staff. Also, the new bill would create a nine-member advisory board that would advise the full-time, thee-member commission on local desires — and also set the salary of the commission. UTA has been criticized for lax oversight that led to high executive salaries, extensive international travel and sweetheart deals with developers. Last year, UTA and prosecutors announced the transit agency was given immunity in an ongoing federal investigation into former UTA board members and others in exchange for its cooperation. Such scandals contributed to the 2015 ballot-box defeat of Prop 1 to raise sales taxes for transit and local roads in Salt Lake, Utah and Box Elder counties. (The tax increase did pass in Davis, Weber and Tooele counties). The new bill would give counties until 2022 to impose all local transportation sales taxes now allowed by state law, or the state would then impose them. That could impose Prop 1 taxes at that time. Also, counties within the UTA area have imposed far different levels of taxes in support of transit through the years, resulting in different levels of service in each. 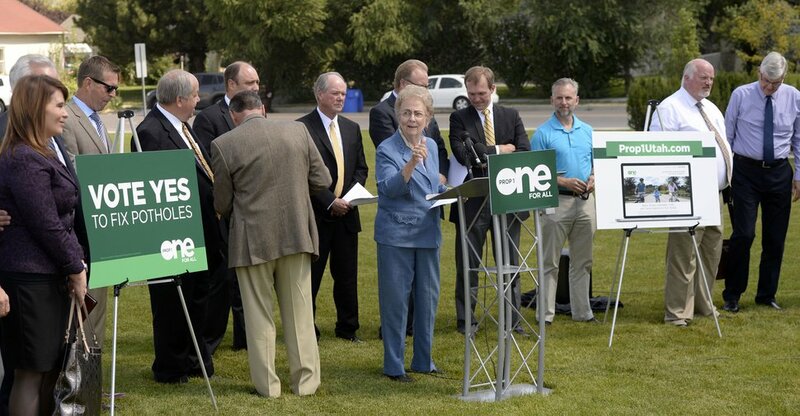 Al Hartmann | The Salt Lake Tribune Midvale Mayor JoAnn Seghini, center, gathers community leaders from northern together to start a press conference in Midvale Thursday August 27 to launch an "education campaign" for Proposition 1 to raise sales tax by a penny for every $4 in purchases for transportation. But George Chapman, a former Salt Lake City mayoral candidate, told the task force, “You are ignoring the will of the voters” who have rejected past tax hikes. Box Elder County Commissioner Jeff Scott, a member of the task force, also protested that only the southern portion of his county is served by UTA, but the bill could impose taxes countywide — and tax some for services they do not receive. Schultz said the proposed increase in registration fees for electric and hybrid vehicles would help ensure that they contribute to highway maintenance — as they largely escape gasoline taxes — but they actually still would be taxed less than a similar gasoline-powered car. Several organizations — from car dealers to environmental and clean-air groups — opposed the move, saying it would remove incentives to buy clean-air vehicles. • Requiring a study into whether UTA should be made a part of the state government. • Allowing formation of “investment zones” to capture for transportation agencies some of the taxes resulting from higher property values that may come from new transit stations nearby, or other transportation improvements. • Exempting the new three-member UTA commission from portions of the Utah Open Meetings Act. Schultz said provisions are modeled after the law covering the three-member State Tax Commission. Informal discussions on day-to-day management could be conducted without those being considered public meetings that need 24-hour notice and posting of an agenda. The bill would require a formal vote in public meetings on policy. UTA officials stressed that lawmakers came up with that proposal, not the transit agency. UTA ran into criticism in recent years when it contended board committee meetings were not public, later reversing that stance.